Bedford NHS couple convince home-hunting daughter to join the new-build fan club! A couple who work for the NHS in Bedford are so happy with their new-build home they are now paving the way for their daughter to purchase a property with the same housebuilder. 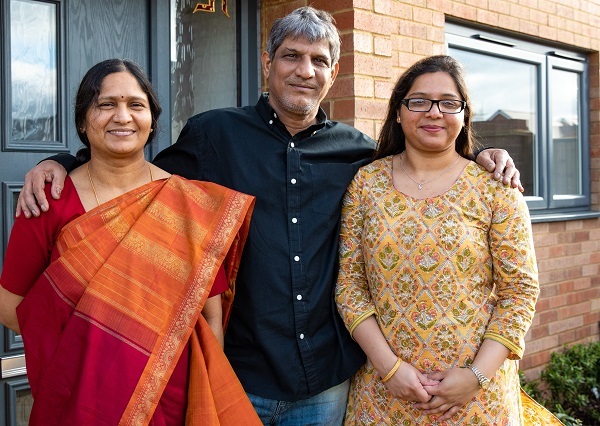 Krishnan Srinivas and his wife Sangeetha Krishnan upsized to a four-bedroom house at Bovis Homes’ award-winning Wootton Park, in Wootton, when they moved south from North Yorkshire, and will soon be helping daughter Namarta to buy her first property. The pair, who now work at Bedford Hospital, used the Government’s Help to Buy – Equity Loan scheme, and are ready to give the 25-year-old, who is reading a master’s degree at the University of Bedfordshire, a leg-up onto the property ladder after convincing her that a Bovis Home is the best option. Sangeetha, who works as a nurse, said: “We’ve spoken with Namarta and we’d all love her to have her own new-build home soon and we’re working on making that possible. “Our experience with Bovis Homes has been super and Namarta’s decision is a result of that. We’d been looking for the perfect house in Bedford, to be close to work and we knew our budget. “Our cousins live further south and they used the Help to Buy scheme and recommended it. It’s been a very straightforward initiative, the Bovis Homes sales team has been absolutely amazing. They’ve been so approachable, helpful and friendly throughout the whole process. The construction of the home was overseen by site manager and Royal Marine reservist Dale Burrell, who recently won a prestigious NHBC Pride of the Job award for excellence in his on-site management skills at Wootton Park. Sangeetha, Krishnan and their 11-year-old son Tushar moved into the house, off Fields Road, after Krishnan, who works in admin, had a look around and urged the rest of the family to view it with him too. The family moved from an older property in York and said they fell in love with the large, open rooms and the big back garden, which offers views over the location. They are also very close to plenty of green space and a park. Sue Holloway, sales advisor at Wootton Park, said: "Sangeetha and her family have been wonderful to support, and we wish them a very happy life in their new home.